Proprietary House in Perth Amboy, Middlesex County, New Jersey, United States, is the only Proprietary Governor’s Mansion of the Original Thirteen Colonies still standing. Under the watchful eye of architect and builder John Edward Pryor, construction began in 1762 and was completed in 1764. 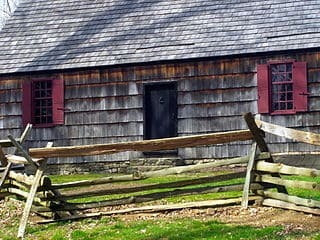 The Georgian style “mansion” was first occupied by Mr. Chief Justice Smyth by rent and approval of “The Proprietors” in town on April 10, 1766 to 1773. In May of 1773, the mansion was repaired and fitted to be the residence of the royal governor of New Jersey, and leased by the Proprietors as such. 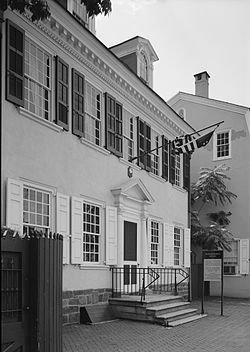 The home was occupied temporarily, 1774 to 1776, by the Royal Governor of New Jersey, William Franklin (the son of Benjamin Franklin). He was arrested on June 19, 1776 by the Committee of Safety of the Provincial Congress of New Jersey. He was taken to Princeton for trial and ordered imprisoned in Connecticut. The house was ravaged by fire in the late eighteenth century. It still attracted a new owner, John Rattone of Perth Amboy, who restored it. Rattone was an ambitious New Yorker who added a large wing and turned the property into The Brighton, a hotel of grand stature in its day. It briefly flourished as an elegant and popular hotel. The War of 1812 brought an end to tourism and the lifeblood of the hotel. Mathias Bruen, who bought the property at a sheriff’s sale in 1817, became one of the wealthiest men in America while he lived here. His descendants made large contributions to America’s social and political history. In subsequent years, the original 11.5 acre site was subdivided, and the former Proprietary House was converted into a Presbyterian retirement home. It was adapted again as a hotel, but with modest accommodations. 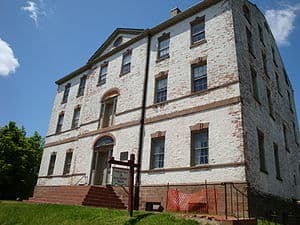 Now owned by the State of New Jersey, a portion of the building is operated as a museum by the Proprietary House Association. The upper floors of the original building and the 1809 wing are occupied by professional offices. The first floor and basement of the Proprietary House have been undergoing extensive repairs and restoration by the non-profit Proprietary House Association. 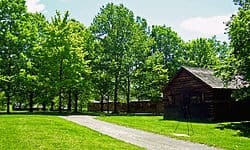 The New Jersey Historic Trust and the Division of Parks and Forestry of the New Jersey Department of Environmental Protection, along with private contributors, have greatly supported the effort to restore some of the former glory of the building. The property was not sold until John Rattoon (first official mayor of the then town of Perth Amboy) purchased it for $1,051 in 1794. Rattoon, a Perth Amboy merchant, had carefully concealed his work as an operator for the British secret service. He tore down the damaged rear portion of the upper story, put on a roof, and refurbished the interior. The War of 1812 ruined the Brighton as a resort. In 1817, it was sold at sheriff’s sale to Matthias Bruen, a Perth Amboy merchant who had become one of the wealthiest men in the nation. He resided there until his death in 1846. The Bruen heirs renovated the property and renamed it as the Brighton. Depression and interruptions caused by the Mexican and Civil Wars doomed the project. In 1883 the Bruen family conveyed the property to the Presbyterian Board of Relief for Disabled Ministers and the Wives and Orphans of Deceased Ministers, where it was used as a home for the families of deceased ministers. After 20 years, the Presbytery returned the property to the Bruen family. In 1904, the family sold the property. Most of its eleven acres were divided into building lots, and Kearny Avenue was cut through. The house experienced a series of owners. Over the years it deteriorated from a comfortable apartment house with a public restaurant to a dilapidated rooming house and suspected flop house. In 1914 a group of Perth Amboy citizens founded the Westminster Historical Society to raise funds to purchase and restore the Proprietary House. In the late 1930s, the house was measured and plans drawn by the Historical American Buildings Survey for a record of this significant property. The plans and photos are held by the Library of Congress in Washington, D.C. Realizing that the importance of the property was as the Proprietary House and not as the Westminster, the Proprietary House Association was incorporated on September 7, 1966, to succeed the Westminster Historical Society. The State was persuaded to purchase the property, and it was placed on both the State and National Registers of Historic Places. Mainly with volunteer help, the Association cleaned out years of accumulated debris and removed walls which had divided the great rooms. The first two floors were open to visitors in 1976. Gradually, it became recognized that the Proprietary House is of state and national as well as local significance. However, the process of decay continually outpaced the process of restoration. Neither the Association or the State were able to pay for historically accurate restoration. In 1985 the Restoration Partnership of Boston, with William S. Pavlovsky as a principal, proposed a plan under which the Partnership would lease the house and 3.5 acres of surrounding land for 25 years. At its cost, the Partnership would restore and renovate the exterior, and finish the interior of the 1809 wing and the upper floors of the main block as offices. Income from the offices would reimburse the partnership. The plan was implemented in 1986. The ground and first floors of the original mansion are leased by the State to the Proprietary House Association, which is charged with raising funds for programming, interpretation, and historically accurate restoration. In late 2011 a historically accurate re-restoration began. Through paint analysis, soon each room on the first floor and basement levels will depict a colorful timeline of its many past occupants. The color of the rooms can now be seen and experienced as they were through the eyes of those viewing them in their era. This museum is a hands-on introduction to the events and people that helped shape this nation’s history. Throughout these phases, the house/museum is always open for tours, events, and exhibits.